Saint John Chrysostom Parish was officially established on Wednesday, February 20, 1952. The new parish in West Roxbury was primarily an off-shoot of Saint Theresa of Avila Parish in West Roxbury and incorporated territory belonging to Sacred Heart, Roslindale and Saint Mary's, Dedham. On January 22, 1952, Rev. (Msgr.) Joseph P. Mantle, curate at Saint Theresa's from 1940-1952 was appointed the first pastor. The site chosen for the new church was on Washington Street, beyond the intersection of Washington Street and the West Roxbury Parkway. A native of Roxbury, Msgr. Mantle prepared for the priesthood at Saint John Seminary and the North American College in Rome. He was ordained in the Eternal City by Cardinal Pompilli on December 21, 1929. Gregory Cardinal Agagianian, Patriarch of the Armenians, touring the United States at the time, ended his visit in Boston in January 1952 and, at the request of then-Archbishop Cushing, named the new parish Saint John Chrysostom. The first Mass was offered in the new church on Sunday, December 14, 1952 with Archbishop Cushing presiding. Attending were The Most Rev. Jeremiah F. Minihan, then pastor of St. Catherine of Siena Parish in Norwood and Msgr. Charles A. Donahue, pastor of St. Theresa's. Msgr. Mantle's pastorate spanned almost a quarter century. Although the official date of his retirement was March, 4, 1975, he bid farewell to the parish in June 1974 and was honored at a reception in the parish hall named after him. Major events in his pastorate were his silver jubilee in December 1954 and being named a monsignor on November 22, 1968. He passed away on September 12, 1979 at Regina Cleri. The Most Rev. Lawrence J. Riley presided at his funeral Mass on Saturday, September 15. A new era of growth in the parish began on March 4, 1975 with the appointment of a team-ministry of two priests, Rev. Paul W. Berube and Rev. Victor C. LaVoie. Team-ministry was a new arrangement in the archdiocese of priests serving equally in a parish instead of a pastor and assistants arrangement. The two new priests, before coming to St. John's, were curates at St. Mary's Parish in Chelmsford. The Most Rev. Lawrence J. Riley, regional Bishop for the parish installed the two on Sunday evening, March 16, 1975. 1977 marked the 25th year of the parish. A dinner-dance reunion was held at Moseley's on the Charles on Sunday evening, October 23. Cardinal Medeiros offered a Mass of Thanksgiving on Sunday, December 18. A major accomplishment of the team ministry was building a parish center adjacent to the church and remodeling the parish hall. Ground was broken for the two-story building on Sunday, September 4, 1977. The Most Rev. Thomas V. Daily dedicated the Center on Sunday, June 18, 1978. The team ministry of Fr. Berube and Fr. LaVoie ended in June 1979. A new team ministry of Rev. Joseph K. Fagan and Rev. John J. Crowley began on October 1, 1979. Within a year, tragedy struck the parish as Fr. Crowley became ill with viral encephilitus. After a long stay at the Faulkner Hospital in Jamaica Plain, he became a permanent patient at the Youville Hospital in Cambridge. Fr. Crowley's assignment at St. John's ended on June 2, 1981. He was succeeded on the team ministry by Fr. Garrett J. Barry. Fr. Crowley passed away on January 31, 1985. The Most Rev. Daniel Hart presided at his funeral Mass on Monday, February 4. In 1981, the church underwent a major renovation. A new entrance was established on the parking lot side and the sanctuary was redesigned with a seating arrangement around the altar. The first Mass was offered at the Easter Vigil. Cardinal Medeiros rededicated the Church on Saturday, September 12. The second team ministry of Fr. Fagan and Fr. Barry ended on September 10, 1985. Rev. Paul A. Phinn was appointed the second pastor on September 12, 1985. Fr. Phinn was no stranger to West Roxbury as he grew up in St. Theresa's Parish. In his seventeen years as pastor, Fr. Phinn has maintained the parish plant in excellent condition. In July 1999, a new steeple was erected over the main entrance, creating a new appearance for the church. Inside the church, a stained glass window depicting St. John Chrysostom graces the back wall of the former sanctuary. New stained glass windows depicting a number of saints have also been installed on all of the other windows. 2002 marked the Golden Jubilee of Saint John Chrysostom Parish. Father Michael was reassigned to Saint Joseph Parish, Needham, bringing a new pastor, Father William S. Dunn to Saint John's in 2011. After 25 1/2 years as a practicing physician and teacher of medicine in St. Louis and Washington, DC. William S. Dunn entered Blessed John XXIII Seminary in Weston in 2002, and was ordained by Cardinal Sean O'Malley in 2006. Following his deacon year at Saint Francis of Assisi Parish in Braintree, and a 4 1/2 �year position as parochial vicar at Saint Mary Parish in Chelmsford, he officially started his post at Saint John Chrysostom on December 12, 2011. He served as pastor until his death on May 20, 2013. Let us pray for and celebrate the life of Father William S. Dunn, physician of souls, as his pilgrimage brings him to eternal life. May he rest in peace. Father Dunn passed away on Monday, 20 May 2013, after a brief illness. Burial was at Saint Joseph's Cemetery, West Roxbury. His illness came upon him suddenly after returning from a trip to the Holy Land with Cardinal O'Malley and a large number of priests. An overflow crowd filled the church with Cardinal O'Malley presiding on May 23, 2013, and he was laid to rest where many of our parishioners have been interred at Saint Joseph Cemetery. He had an interesting background. One of 7 children, he grew up in South Dakota and travelled extensively throughout the United States. A medical doctor, he did training in Worcester, MA, taught in St. Louis and Washington, DC and found time for a Masters degree in public health at George Washington University. In his youth, he thought of becoming a priest. The call came back in his late fifties. He entered Pope John XXIII National Seminary for Delayed Vocations in 2002. Four years later, there was Dr. Dunn becoming Father Dunn at the hands of Cardinal O'Malley. His first assignment as parochial vicar was to Saint Mary Parish in Chelmsford. On December 13, 2010, he was appointed the fourth pastor of our parish. Many of us remember his first weekend at Saint John's when he introduced himself, telling us his life story with a sense of humor. His pastorate was a mere two years and four months and he was taken from us much too soon. Tall, friendly, quiet and personable, he was a priestly gentleman. May he rest in peace! Kindly keep Father Dunn in your prayers. Thank you. 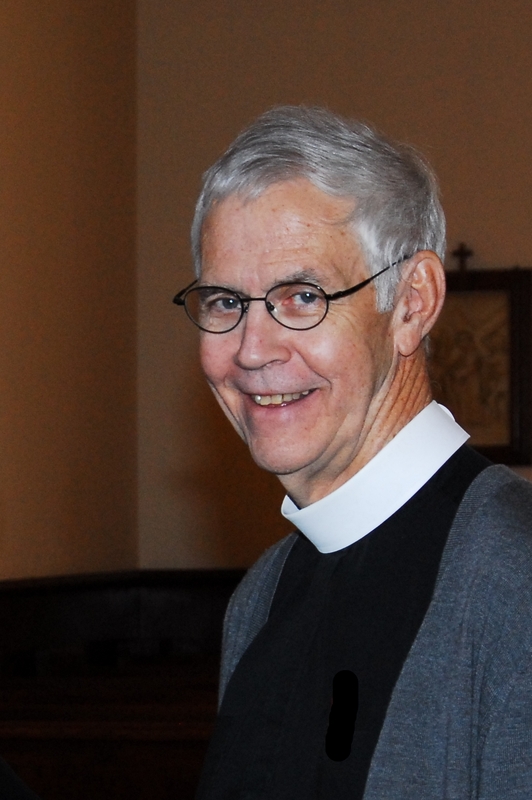 Following the untimely death of Father Dunn, Father Saint John Chrysostom�s Parish community was happy to welcome Father John Connolly in his new position as Administrator. Father comes to us as a man and priest with many gifts from God and experiences in the life of the Church, he is eager to share them with our Faithful community. Father John J. Connolly, Jr. grew up in Jamaica Plain, the son of John and Barbara (Sweeney) Connolly. He has a brother James. He attended Blessed Sacrament Grammar School and Boston Latin, class of 1977. After High School, he worked as a school teacher. Father was ordained May 21, 1994, by Cardinal Law. He offered his first Mass on May 22nd at the Blessed Sacrament Church in Jamaica Plain. 2005-2008 Rector Holy Cross Cathedral and Administrator of Holy Trinity Church, Boston South End. 2009-2013 Pastor of St. Brendan's Parish. He serves as special assistant to Cardinal O'Malley and Chaplain to the Boston Police Department.